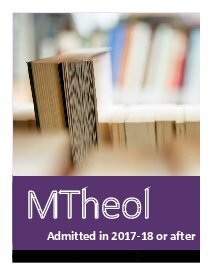 The MTheol programme aims to provide students with advanced competency in a specific area of theological discipline. The programme is a preparatory degree for further graduate study at the doctoral level, or for academic research and teaching that focuses on one area of discipline, or for students to develop advanced practical-theological competence in a specific area of ministry. The goal of the programme is to provide the students with expertise for academic research, the ability to integrate what has been studied and the skills to relate their studies to their contexts. The students show advanced practical-theological competence in a specific area of ministry. The MTheol degree is conferred by Divinity School of Chung Chi College in lieu of The Chinese University of Hong Kong. MTheol students are registered as “Associate Students” at The Chinese University of Hong Kong. A recognized MDIV / BD or a good MA academic degree in Christian studies. Two letters of recommendations, one from the church and one from an academic institution. The requirement of an entrance exam is at the discretion of the admission committee. English language requirement: IELTS (academic) 5.5 or equivalent scores in another recognized qualification. Applicants obtain an English Grade D in HKALE or a HKDSE English Grade 3. 12 credits: Comprehensive Examination consisting of two exam papers: the first is a general paper of the area of concentration, and the second is a specific paper of the area of concentration. 6 credits: One extended research paper of the area of concentration with no less than 15,000 words (English) or 22,000 characters (Chinese).